For thermocouple sensor calibration of the complete EaziVal system the actual temperature of the calibration source must be accurately known. EaziVal provides multi-point calibration at “high”, “low” and “check-point” temperatures with the scale and offset values automatically calculated for each sensor. 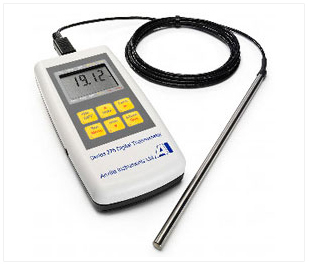 Using a Series 275 digital thermometer as the UKAS calibrated temperature reference this information can be entered into EaziVal. The calibration results are then stored for reporting. - PT100 sensor The 275 is supplied with a single 1/10 DIN 100O sensor in a stainless steel sheath 6mm diameter x 150mm length with 2m PTFE lead. Operating range: -80°C to 250°C. - UKAS calibration points 0°C, 100°C, 121°C, 134°C and 150°C, other points to special order.